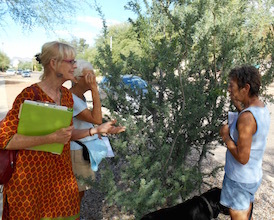 Observers participate in Nature's Notebook with the Tucson Phenology Trail. Many communities are creating Phenology Trails as a way to collaborate on research, management, or educational outcomes. Below are several examples of our most active Phenology Trail with programs utilizing Nature's Notebook. Want to start a Phenology Trail? Are you someone who enjoys creating relationships in your community? Are you good at organizing events and people? If you work with a number of agencies in your area and would like to create shared meaningful programming, then establishing a Phenology Trail is a great place to start by monitoring phenology in service to a shared research question or outreach and education strategy. For more information on what to do review our Phenology Trail resources and Program Planning Materials. Consider joining our Local Phenology Leader Community of Practice for help with ideas and resources.